First came a stroll down the canting keel of his IMOCA 60, Hugo Boss, while under sail. After that came a sprint up the mast. For the third installment in Alex Thomson’s “walk” trilogy, however, he had to employ one of the other vessels in his personal fleet, a diminutive kiteboard, to help launch himself nearly 300ft in the air at the end of a line running from Hugo Boss’s mast. 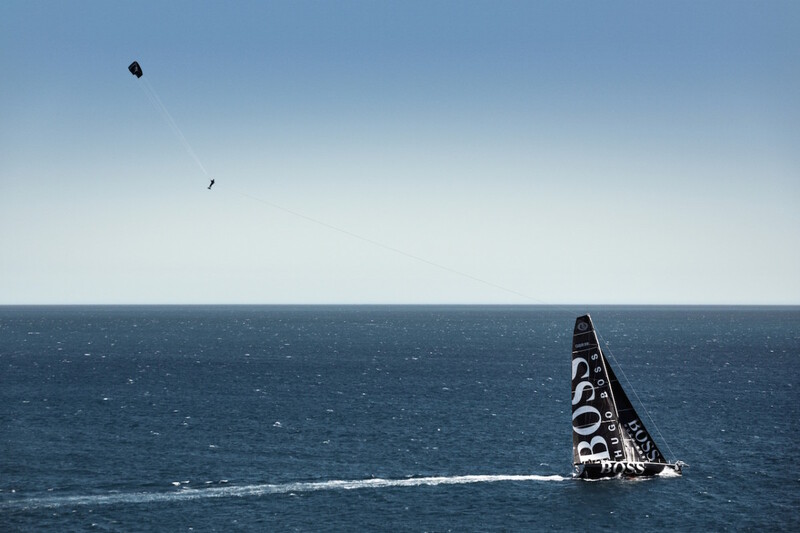 To catch such big air, Thomson first chased down Hugo Boss via kiteboard, then attached himself to a pre-rigged cable. After that the speed of the boat launched him skyward—much like those parasailing tourists you often see drifting about places like St. Thomas and Miami Beach. At the end of his flight, Thomson simply detached himself from the cable and then drifted back down to the briny, where he promptly set out kitboarding again—all the while dressed to the nines in a Hugo Boss suit, of course. Pretty cool stuff, although we think it’s safe to say that even more impressive would be a strong finish in the Vendée Globe, which begins November 6—all the more so given the streak of breakages and just plain bad luck that have plagued his career since he took third in the 2012-13 race.